Now, I told y’all about this amazing piece of equipment – the GE Advantium 240 Wall Oven – a few months back. 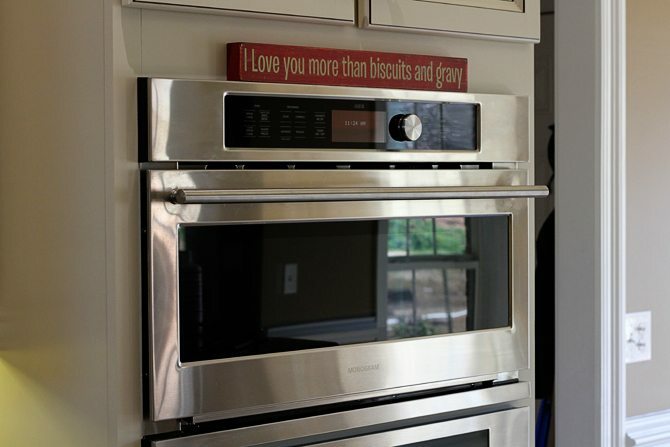 Well, trust me when I say that my love for this appliance has only grown. So I wanted to show you again just how quickly it can get supper on the table. Now, I’ve given you both my Advantium and my standard oven versions below. You’ll see that the Advantium recipe cooks in about half the time of the standard oven. Half the time! That’s because the Advantium is a speed cook oven. It combines convection, microwave, ceramic heat, and halogen bulbs to cook things in a flash. The best part is you don’t sacrifice quality, flavor, or texture. Let’s get to cooking! So, here are a few notes about this recipe. Because of the short cooking time (in both methods) I’ve opted for frozen bell peppers and onions. They cook through faster and offer a softer texture than fresh. If you’re feeling adventurous, you can chop your own onions and peppers and saute them in a super hot skillet before mixing the casserole together for even more flavor. Let also chat about our seasoning here. There are tons of fajita seasoning packets out there. Feel free to use your favorite. I’ve tasted a bunch of them and this McCormick version is my absolute favorite. It has a smoky flavor that really adds to the dish. Now, don’t go hunting all over town for it – nothing is worth that – but if you can find it, get it. This recipe also calls for a can of diced tomatoes with chilies. I used the mild version here, but if you like heat – go for your favorite heat level. Preheat the oven to 350°F. Lightly spray a 9x13 inch baking dish with nonstick cooking spray. 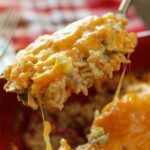 In a large bowl, combine the chicken, uncooked rice, cream of chicken, sour cream, diced onion and bell pepper, tomatoes with chilies, chicken broth, fajita seasoning, and about half of the cheese. Mix to combine. Pour the mixture into the prepared dish and spread it evenly. Bake for about 25 minutes. Remove from the oven, top with the remaining cheese and return to the oven until the cheese is melted. Lightly spray a 9x13" casserole dish with nonstick cooking spray. In a large bowl, combine the chicken, uncooked rice, cream of chicken soup, sour cream, frozen onion and bell pepper, tomatoes with chilies, chicken broth, fajita seasoning, and about half of the cheese. Mix until well combined. Pour the mixture into the prepared dish and spread it evenly. Place the dish in the Advantium on the metal tray and cook for 15 minutes on these settings: U=4 L=10 M=7 C=10. Remove from the oven the oven with 2 minutes remaining and add the remaining cheese, finish cooking. While the Advantium oven was provided by the amazing folks at GE, the opinions expressed here in are my own. A positive review can never be bought. I just really love this thing! No. Parboiled rice and instant rice are two different things. They require different cook times and different amounts of water. If I were to use taco seasoning would this alter the taste a lot? Can I use uncle ben’s ready rice for this recipe? If that’s the precooked stuff, yes you can. You’ll just want to reduce the amount of broth you use. MINUTE RICE, in a red box, is our brand of minute rice around here. how much time does it take for regular rice? I used it instead of instant. Just add 5 or 10 minutes. wouldn’t you have to add extra liquid to use regular rice? Yes, I’d add at least another cup of broth. I have never left a comment before, but felt like I had to. Dinner is always a chore, tough to please everyone. Well, this was a huge hit! I substituted 3 cups of frozen riced cauliflower and used half the cheese. I did add a tiny bit of sofrito to make it a little more spicey. My teenage boys, who wouldn’t eat cauliflower if their lives depened on it, loved it, and didnt even know it was cauliflower. Definitely making a couple of these to have in the freezer. Thank you again. I am so thrilled to hear y’all enjoyed this one, MJ! Thanks for the comment! So, do you think I could make this in the the Crock Pot Casserole Crock? Would there be enough liquid to get the rice done? I’m assuming you’re using Minute Rice, correct? It sounds really good!!!! Thank you! Absolutely! Yes, there should be enough liquid for the rice. And yes, instant rice and Minute Rice are the same thing. I sure hop you enjoy it, Samantha! How long would you cook it in the slow cooker casserole? I would recommend 4 to 6 hours on low. In my opinion it’s not the same thing. Only that they (yes) both rice, but not the same.(equal). Instant minute rice is faster to cook,less time, But, the regular rice takes longer. However, both equally good. Your Hispanic people probably would not think of using nothing but the traditional rice, not minute maid. Actually, we were talking about minute rice and instant rice being the same thing, not traditional rice and minute rice being the same. I’m not able to copy and paste your recipe into a WORD document so I can then save it to my recipe files. When I try, it just doesn’t paste in the recipe, just the “read more…” part. I hate having to re-type recipes, especially when it usually is so easy to copy and paste. Frustrating and disappointed in SSI. Word doc printing. Find your receipt then open up word program and have ready. Go back to recipes and copy and paste. I have use this for a long time. Open Word copy recipe and paste. That’s my method also – highlight the recipe, copy and then paste in WORD and then save to my file. Your recipe doesn’t allow me to highlight it. Even when I click over to print, it immediately wants to print the document and won’t allow me to highlight it for copying and pasting. Oh well, some work and some don’t. Thanks. It’s actually a security feature to keep people from stealing content. The print method should work though. Even if the print dialogue pops up, just click cancel and you should be able to highlight from there. Does anyone use Microsoft OneNote? It is a virtual binder, You are able to print any document to any section or page you want or have created; so no need to copy and paste!!! It also allows you to insert screenshots. I use it it at work and at home and i HIGHLY recommend using it as a recipe binder!!! Click on the print button. When it opens in that print screen, click on the picture in there and see if it opens up bigger and then try to highlight it. It worked for me. Usually I just save to Pinterest though. Forgot to say that I am having no problem highlighting as normal though on my iPad. Have not tried this recipe but will soon. Was wondering if you’ve tried the recipe with Lawrey’s Chicken Fajita mix. It’s made by McCormicks and we love it. By far our favorite fajita mix. I haven’t, but will certainly put it on my list! I am such a sucker for cheesy dishes. This looks delicious! I’d love to grab a fork and dive in. I am confused by your description, you say you added more broth and did not drain the rotel because you used regular rice instead of instant? But then you go on to say, if you do not have instant, cook your rice first? So did you add extra liquid because you used regular rice and if you cooked it first, why add extra liquid? Since she used uncooked, regular rice she had to add additional liquid (broth) to accommodate the need to cook the rice but if you use already cooked (regular rice) the additional liquid (broth) won’t be necessary. Hope that helped…? I hate sour cream but this recipe looks awesome!! Can I omit it and use more soup? Thanks! Sure, but it will change the flavor a bit. You might try plain yogurt as a substitute for sour cream. 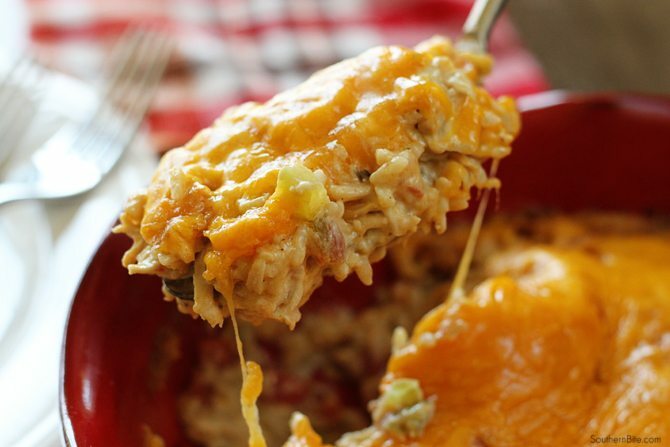 I make casseroles for some extended family who, like you, dislike sour cream. I have found that plain yogurt is a good alternative in many recipes. Admittedly however, I have not tried it in this one. Stacey, I am absolutely thrilled to have found this post. We are remodeling our kitchen, and when it is done I will have the Advantium oven. I talked my husband into it, because it is pricey. I’m sure that by following your recipes my learning curve won’t be as steep. It’s really amazing what all you can do with it. Hop you enjoy it as much as we do. Can you make this up ahead of time and bake later or will the rice soak up the juices? I’m so excited to see you posting the GE Advantium 240 Wall Oven recipes. I just had my kitchen redone and had this oven installed. We grilled a strip steak that turned out perfect, med. – rare. Can’t wait to try more recipes using it!!! Hi Stacey. I made this for dinner tonight and it was delicious! We really loved it and I’ll definitely be making this again. I love how fast and easy it was, especially since so many casserole recipes look easy but requite a lot of chopping, dicing, sautéing, and clean-up before putting everything in the casserole dish to bake. This couldn’t have been easier! Thanks!! Yay! So awesome to hear!! Glad y’all enjoyed it!! Very good! Made this last night! My guys said it was a keeper!! My husband doesn’t care for rice. Anyone tried this with maybe an 8oz package of egg noodles? I’ve never tried it, but it sounds delicious! I’ve not tried it with noodles, but love the idea! I would recommend cooking the noodles first if you go that route. You might could try layering the mixture with tortillas in lieu of rice. I’ve seen similar recipes before. I forgot cream of chicken, can I use cream of mushroom instead? since that’s what I have on hand. I have a regular oven. Are the cooking times the same? Instructions for a conventional oven are just below the Advantium instructions. Just keep scrolling down. Hi Stacey, this looks and sounds yummy! A quick question, can this be frozen? There’s only 2 of us and we’d have so much leftovers. Thanks! Love your recipes! I think it should freeze just fine. I made my own rice before and still put chicken broth…… Is this going to be ruined now ? Nah. Might be a little soupy, but not ruined at all. Do you think this would work with ground beef? It sounds delicious! I definitely think so! Just cook, drain, and then add to the recipe just like the cooked chicken. Wonderful! That’s so great to hear, Sha! I have the Advantium 120 oven, how would this affect the cooking time for this recipe? Just might need to cook it a little longer. Do u cover this dish or leave uncovered?? I just tried this it came out soooooo good I put some of my own things in but it was really. So glad they all enjoyed it! I think the black beans would be a great addition. Have you tried freezing this dish before baking? I’ve not, but I’m sure it would work just fine. Lizzie, comment like this just make my day. I’m so glad everyone enjoyed it. Thanks for sharing the recipe! This recipe is fantastic!! And made a ton. My grand kids were visiting and my one grandson is a eater. He and I most certainly share a love for food! We couldn’t get enough. I have made chicken casseroles before, many times. I know what makes this one stand out, it is the addition of the fajita seasoning. Love that flavor!!! And yes it freezes well. Thanks, can’t wait to try more of your recipes. So glad to hear you and the little ones have enjoyed it so much! Can you do this as a freezer meal for someone who just got out of hospital? Trying to make a bunch of casseroles to stock them up! I don’t see why not! Aren’t you sweet to help out like that! do you boil chicken first or bake chicken with all ingredients ? The chicken should be cooked ans shredded before being mixed into the casserole. You can also use shredded rotisserie chicken. Can this be converted to slow cooker? I’m sure it can, though I’ve not done it that way. What is the nutritional value of meal? Unfortunately, I don’t keep up with that. Just for kicks, did you drain the Rotele Tomatoes and Chilies or not. Lots of peeps asked on Plate, but it wasn’t answered…..I’m funny about knowing things like that. I used to produce a cooking TV segment and got skewered if I didn’t tell them EVERYTHING. Now I’m that person! (= Thanks. No, there’s no need to drain it. That’s why I didn’t mention it. I’m a stickler about those things to so I always make sure to include it. Enjoy! The directions say to drain but now you’re saying not to. I’m confused. Well, that makes two of us! 🙂 In the end, the very small amount of liquid in there won’t make a huge difference. I’ve updated everything to make sure that it says undrained. Can I use regular rice? If so how would the recipe change? Like add more liquid or just cook it longer? Thanks! Yes. I think a longer cook time would be the only alteration. I’ve had an GE Advantium oven for over 2 years I love it, but have found very few recipes for it…and food places to start looking? Have you checked out the Advantium website? How many calories is this ? Hi Patricia! I don’t keep up with nutritional content. There are several sites out there where you can input the ingredients and get a general idea, though. Does uncooked instant rice get done? I always worry that it won’t. Yes, I’ve never had it not get done. I hate to hear that. Tell me what the problem was. I’ll be happy to help, I just need a little more info. Made this the other night and it was really good, it made alot for 2 people but I took leftovers to work and shared with co-workers, I also put it in a flour tortilla shell along with fritos and it was the bomb! Lol Thank you for a very easy recipe and tasty too. Sounds great, Denise!! Glad you enjoyed it! Love the recipe but you have so many pop up ads on this page that it kept taking me off the recipe while I was making it!! Very aggravating!!! I agree with Kelly. There are so many ads to load it takes forever to actually see the recipe. Making it now. Hope it’s worth the wait because I doubled the recipe : ) Let’s eat! SO glad I doubled this. It’s really good. Sent some home with friends. Awesome, Lisa! So glad y’all enjoyed it! I’m so sorry, Kelly! As you know, I share the recipes with y’all for free and in turn, I’ve got the host ads to pay for all the expenses. My hosting service costs as much as many folks mortgages. Please bear with me. Well this is a hit with my son. I used instant brown rice. He didn’t even notice! Great idea to sneak in a little nutrition, Wendy! So glad y’all enjoyed it! Are you supposed to cook the minute rice first? I used instant rice and didn’t cook it prior but it didn’t cook right! I did 25 minutes, then added cheese and went about 4 more minutes. The rice was hard! It had great flavor so I’m hoping to get it right next time. Any tips? No, the rice should cook right in the casserole. I’ve not had that trouble with instant rice in this case. Was the casserole dry? I just made this recipe tonight. I used (uncooked) Instant Rice as posted in the recipe. The rice would not cook. After 30 minutes the rice was still hard. Had to cook it for almost an hour. Ended up all dried out. But the flavor was very good. Next time I would definitely cook the rice before combining everything and putting it in the oven. Hmmm… That doesn’t really make sense as to why the rice wouldn’t soften. Sorry you had trouble. Do you think I could leave out the rice and it still prepare and cook the same? I try to avoid the carbs and my family are not big rice eaters. Thanks! Sure! Just cut back on the broth too. I also do low carb and am going to substitute califlower rice. I am so excited as it the casserole sounds so delicious. I am making it tonight as i just bought all of the ingredients. Would like to try this recipe, it looks delicious! Wondering if I used regular rice, knowing that the cooking time will be longer, do I still need to use precooked chicken? I would still opt for the precooked chicken. If I make it and freeze it, how do I reheat it? Does it have to thaw first or can I just put it in the oven? You can either thaw it first or start it in a cold oven. You just don’t want to put a cold dish in a hot oven – it might break. I’m wanting to make this for a friend in advance. So I could make it, give it to them the next day, then they take it home and reheat it and I’ve never done this before so I’m lost. Thanks in advance. Made this tonight. Delicious! I used regular rice & it had to cook about an hour. Thanks for the tip! Glad you enjoyed it, Alison! Packed full of flavor! I added a can of drained corn and garnished with fresh cilantro- delicious! Thanks for the recipe! Yum! So glad you enjoyed it! I’d use about 1/3 of the broth and just cook until it’s heated through. I’d use about 3 cups of cooked rice. Good luck! How do you cook your chicken breasts for this recipe? I usually use a rotisserie chicken when I’m short on time. Otherwise I roast them or cook them in water low and slow with salt and pepper. I made this for dinner last night! I used cooked brown rice and omitted the broth. It turned out really tasty! I will be making this again. So glad you enjoyed it, Lisa!! Any side dish recommendations?? Also, would adding ranch style beans change anything? Thanks! We often have just this casserole and some salad. I think adding the beans would be great! Did you cook the onions an peppers or did you add them in frozen? So glad you mentioned using regular rice in this recipe. I really dislike instant rice and even if it soaked up all the goodness of the other items, it would still taste like wet cardboard to me. Try this with Tex-Mati rice or Jasmine rice, yum-yum. Also like the idea of adding beans of some sort. It’s getting cold here tonite,(Tenn.) think I’ll try this! Could you use cauliflower rice as opposed to regular/instant rice? I’ve not tried that but I think it would work just fine. Thank you for the recipe with the Advantium directions. We’ve owned an Advantium since 2002 and wouldn’t be without one. I’ll have to give this a try. Hope you’ll enjoy this. We sure enjoy it and our Advantium! That’s genius, Larry! Thanks for sharing!! This was a great dish! My family absolutely LOVED it!!! I will be putting this in my rotation. Thank you so much!!!!! There’s not higher compliment in my book! So glad y’all enjoyed it!! This looks so good – can’t wait to try it! Just one question re the Rotel; in the ingredients it says undrained, then in the prep, it says drained. Do you add the juice? SO sorry for the confusion! It should all say undrained now. That liquid adds great flavor. Hope you’ll enjoy! Made this casserole for dinner tonight. It was wonderful!!! The entire family enjoyed it! It was just the right amount of spice to add flavor but not so much that your mouth was on fire all evening. It was a great meal for a cold wintry night. I’ll definitely be making this one again! Thanks!!! Love hearing that, Linda! So glad y’all enjoyed it! How long would you cook it in a regular oven? There are regular oven instructions right below the Advantium instructions. Made this tonight and it was a hit. Will definitely be making it again. Love hearing that! Glad everyone enjoyed it! So just wondering if you could use refried beans and add a little tortilla chips on top? Hi Stacey. 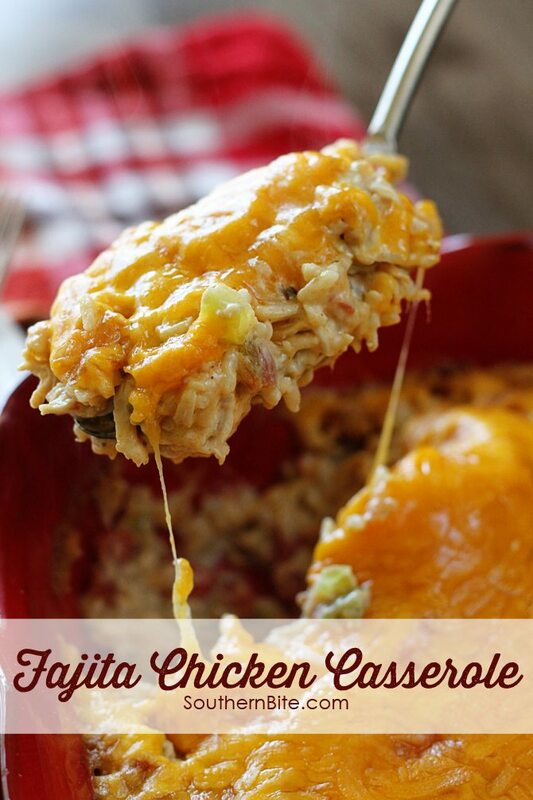 I’m making this Fajita Chicken Casserole again tonight, at my husband’s request. We both really love it. Since I make this so frequently, I just wanted to comment again (since my last comment back in March of 2016). 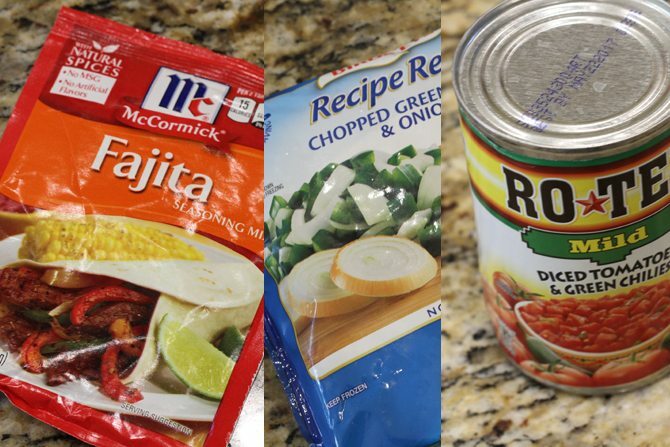 I wanted to let you and your readers know that last time I made it I realized I didn’t have any more fajita seasoning in so I used a packet of taco seasoning, the McCormick Chipotle Taco Seasoning packet. The casserole came out so good, with a bit of a smoky flavor. We liked it so much that I’m going to make this dish with that packet from now on. Thanks again for this recipe, Stacey! Awesome! Love hearing that! So glad y’all have enjoyed this one! Amazing recipe, Stacey! I did make homemade cream of chicken soup (me and cans have issues) and added 1 teaspoon of cumin. This recipe will be used over and over again! Wonderful! So glad you enjoyed it!! I have made this 3 times now and we love it! I have made this 3 times now and it is delicious!! That’s the ultimate compliment! So glad you’ve enjoyed it!! This looks really tasty. It took a while to get to the bottom of all of these comments….now I forget what I was going to say. Oh, tasty…right. Fajita chicken…this pin is going on my Mexican Food board. YUM! Ha, yep! Lots of great comments on this one! Folks just love it! Had this before and it’s delicious. Now I’m on a ketogenic diet and wondering if the casserole will hold up if I use no rice? Or will it be ruined? I made this for my family last week and I am dying to make it again already!!! Wooo hoo!! So glad y’all enjoyed it!!! This looks yummy. If I did this in the crockpot would it be with raw chicken instead of cooked? I saw a comment that you mentioned cooking it 4-6 hours on low. I don’t have instant rice so I’ll use regular. Do you think this recipe would freeze well for a “freezer meal”? If so, would you cook it first or not? I don’t do a lot of freezer cooking, but would imagine it should work. I’m not sure about freezing the rice uncooked, though. I think I might cook it first. I made the Fajita Caseerole tonight for dinner and ot was absolutely wonderful . My husband loved and I will definitely Malle it again very soon . I had salsa , sour cream and chips on the side. This recipe is very easy to make. So easy. So quick. So delicious. So making it again! Ha! I’m so glad you enjoyed it, Beverly!! This sounds yummy, but my husband is not a fan of rice and egg noodles are not his thing. Can I prepare this without the rice or noodles and will it still come out okay? I’ve not done that so I can’t say definitively. You would need to probably cut back on the liquid if doing so. STACEY, Thank you for sharing an Advantium recipe. I have had the 120 version now for several years and love it, but haven’t used to to full potential, just tried to convert using similar recipes as in their cookbook. The Advantium is definitely one of GE’s most amazing products! We enjoy all kinds of different “Mexican” foods so I can’t wait to try this one. I sure hope you’ll enjoy it!! I sure LOVE my Advantium! I don’t use the bagged rice much, but if I remember correctly, 1 bag equals about 3.5 cups when cooked. That said, 1 bag should work just fine in this recipe. I have made this several times and it always turns out delicious. It’s a keeper! Do you know if I would have to make an adjustment in the amount of chicken broth if I used instant brown rice instead of instant white rice? Also would I have to cook the casserole longer? Measurements and cooking times should be the same. Enjoy!! Well it’s the new year and sitting in my fridge is a half turkey breast I was going to cut up today and freeze. But no longer it’s going in this recipe. Crossing fingers. Since there is just me I think I’ll line two 8×8 cake pans and freeze one and bake one. Hope it turned out great for you!! Has anyone tried it using frozen cauliflower rice instead of instant? I just made this and it’s delicious BUT it seems overly runny! Will it firm up?? Yes, it usually will. Did you swap anything in the recipe out for a different ingredient? Made this tonight for dinner. It was not a hit. It was more like a dip that would be served with chips at a party, but definitely not dinner worthy. The flavors were all good, just looked like mush on a plate. I sure hate to hear that it wasn’t what you had hoped. Stacey, thanks so much for your patience with all of us! I am utterly amazed at how you respond to everyone, when the same questions come in over and over. And we do understand about the ads. So carry on and keep up the good work! By the way, your recipes are soooo good! Well worth wading through ads to get to! And I sure appreciate your kindness, Phyllis! Have a GREAT day!